An absolute indulgence you simply must, well, indulge in? The Body Collection by La Mer. This lotion duo will transform your skin from dry and cracked to supple and shining in no time flat. 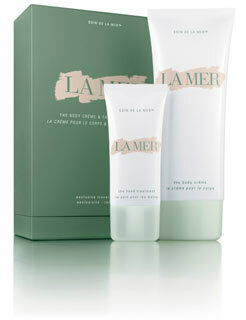 Combining La Mer The Hand Treatment and La Mer The Body Creme into one convenient duo, La Mer has seriously solved the problem of ravaged skin. The tubes themselves are quite ingenious. Each is crafted in a flat rectangular silhouette with a wide top that twists off easily and painlessly. They stand upright on a dresser or vanity without any problem at all, and they're super-easy to toss in a bag and carry around with you throughout the day. But what I really love is the products themselves. Each moisturizer leaves skin feeling so silky and smooth with only the smallest dollop of product. Upon first application of The Hand Treatment, my digits were no longer calloused or rough. The same was true of The Body Creme, which made the ashiness on my legs and elbows disappear for good. Best of all, they sink in immediately and create absolutely no greasy residue. Your skin will literally feel like silk! I am totally enamored of both products, which have totally transformed my skin. I glow from head to toe! You'll feel like a queen every time you slather yourself in either of the moisturizers -- and that, my dear beauty chicks, is priceless. Unfortunately, this gift set is no longer available. However, you can purchase The Hand Treatment for $75 here and The Body Creme for $235 here.